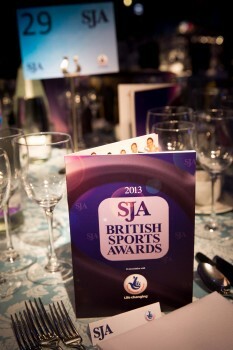 The 2013 SJA British Sports Awards, sponsored by The National Lottery and staged at The Pavilion at the Tower of London on December 12 before 400 guests from sport and the media, were widely acclaimed by all present for some slick staging, excellent presentation by Jim Rosenthal and Sybil Ruscoe, and many well-deserved gongs for Britain’s sporting champions of 2013. As announced at the presentations, online and via the SJA’s Twitter live feed, the winners of our principal awards were Andy Murray, Christine Ohuruogu and the British and Irish Lions. 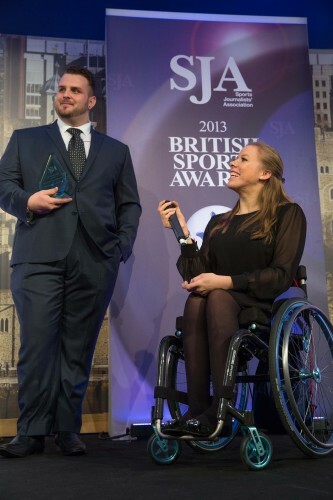 As well as the announcements of the winners of the Sportsman, Sportswoman and Team of the Year, the 64th annual SJA British Sports Awards – the longest running sporting awards in the country – also recognised outstanding achievement by the nation’s sports heroes in other ways. Thus, the first presentations of the afternoon drew as much admiration and respect for their recipients as would the winners of the four major prizes that were handed out towards the end of the ceremony. Olympic gold medal-winning rower Katherine Grainger, now a regular and always welcome guest, set the tone for the afternoon when she paid an moving tribute – without notes – to Dame Diana Ellis in presenting the JL Manning Award for services to sport by a coach or administrator. Competitor, team manager, the first woman Steward at Henley, and chair of British Rowing for almost a quarter of a century, Dame Diana has had a role in her sport at a national level for 52 years. “I’m only sorry you had to wait so long before the British women’s team won an Olympic gold medal. Had we won gold sooner, you might have been able to retire earlier,” said Grainger, knowing all too well the agonies of her three successive silver medals at the 2000, 2004 and 2008 Games before her golden moment with Anna Watkins in London last year. Welcomed on to the stage by an imposing “guard of honour” made up of members of the British Rowing squad, including members of three world champion crews, Dame Diana’s first response was, “I’m living proof that you don’t need to be big to be a rower,” although the sport’s highly successful performance director, Juergen Grobler, sitting at a table nearby, was seen to smile and shake his head. Times have changed seemed to be his suggestion. 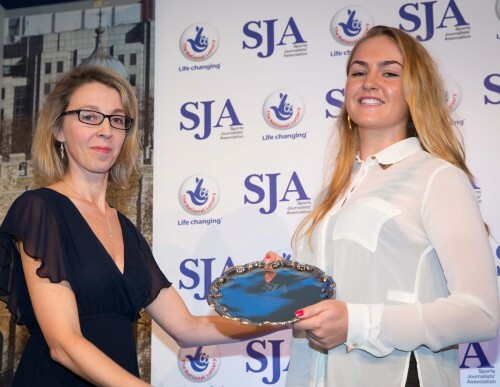 What was the Sports Writers’ Association, now the SJA, has always tried to innovate around its sports awards, introducing things which other organisations have later followed. 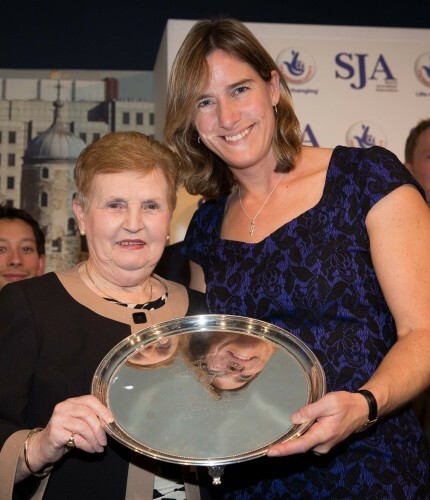 We were the first to recognise the achievements of British sportswomen in 1959, and our disability sport award, the Bill McGowran Trophy, has been in existence almost as long as Dame Diana Ellis has been involved in rowing. This year marked the 50th anniversary of the Bill McGowran Trophy and its recipients were both double world champions from track and field, discus thrower and shot putter Aled Davies and wheelchair racer Hannah Cockroft. Their presentation, made by Tim Hollingsworth, the chief executive of the British Paralympic Association on the day which marked 1,000 days to go before the Rio Paralympics, and The Sun’s Vikki Orvice, was brought forward in the scheduled order to accommodate Cockroft, who had an engagement with Strictly Come Dancing for Sport Relief. Now a student on a media course at Coventry University, Cockroft spoke of the difficulties of the “job”, just in getting hold of people to interview. Welcome to our world, Hannah… the application form for Associate Membership of the SJA can be found here. The National Lottery presented the Spirit of Sport Award for the first time, with Rod Carr, the chair of UK Sport, and Lottery MD Andy Duncan, clearly delighted to be able to recognise the stellar career of sailor Sir Ben Ainslie, who during his interview by Sybil Ruscoe after lunch let slip that in the longeurs when he was waiting to make his entry for Team Oracle in the America’s Cup, he had had to endure a lot of sport on American TV and it was, “Rubbish”. Sir Ben later told of how, having spent his Olympic sailing career in single-handed boats, the whole team element of the America’s Cup was a novel experience for him, and while he modestly explained that “fast boats make for brilliant tacticians”, his intervention was crucial in turning around a 8-1 race situation on San Francisco Bay into a 9-8 victory in one of the greatest of all sporting comebacks. The dangers of his sport had been made poignantly evident earlier in the series when Ainslie’s friend and former British sailing squad colleague, Andrew Simpson, was killed in an accident training for the event. Sir Ben is now spending much time supporting the Andrew Simpson Foundation, raising funds to offer sailing opportunities to schoolchildren. 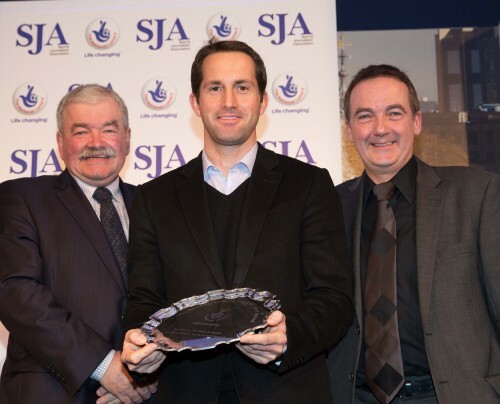 Ainslie placed fourth in the ballot of SJA members for the 2013 Sportsman of the Year, with Wimbledon champion Andy Murray the overwhelming winner, collecting three-quarters of our members’ first preference votes, ahead of double world champion athlete Mo Farah and Tour de France winner, Chris Froome. It is an awesome top six that is testimony to the absolute purple patch that British sport is enjoying at present. As many acknowledged during the ceremony, much of that success is due to the financial assistance provided by The National Lottery through UK Sport, which Carr highlighted would amount to more than £350 million across all Olympic and Paralympic sports in the four-year cycle to Rio 2016, when the challenging aim is for Britain to win more medals at their first Games as “post-hosts”. Murray is only the second male tennis player since our inaugural year of 1949 to have been named our Sportsman of the Year, following Greg Rusedski in 1997. But then Murray does now have a marketing operation called “Seventy Seven” which reflects the wait in years for that elusive men’s Wimbledon win after Fred Perry. Angela Mortimer (1961), Anne Jones (1969) and Virginia Wade (1977) thankfully reduced the waiting for a champion on the women’s side, and all won our Sportswoman of the Year prize in the year that they won Wimbledon. Our members were no less spoilt for choice when it came to voting for the Sportswoman of the Year – our top six all won world titles in 2013. Indeed, Cockroft, as a world champion, placed seventh in our polling while dressage rider, Charlotte Dujardin, followed up her Olympic gold won at Greenwich with two 2013 gold medals at the European championships, yet could only place eighth in the voting among such esteemed company. 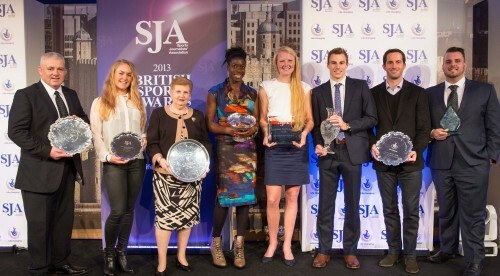 It is the 26th time, since the Sportswoman award was inaugurated in 1959 when Mary Bignal – later Mary Rand – won our silver salver that a track and field athlete has taken home this trophy, Ohuruogu succeeding our 2012 winner Jessica Ennis who had won our award in three of the previous four years. It was the second time in the afternoon that the 400-metre world champion had been on the stage. 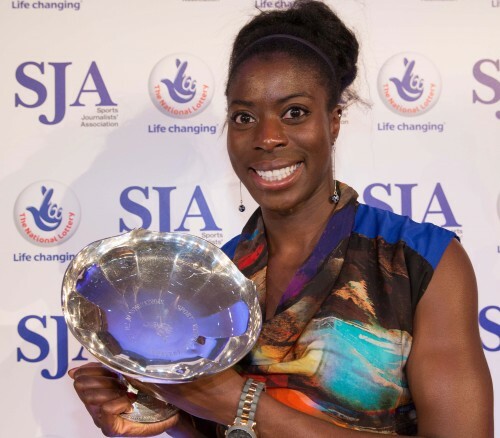 Earlier, SJA member, author, journalist and rowing coach extraordinaire Dan Topolski had presented Ohuruogu with the Pat Besford Trophy for the outstanding performance of the year, for managing to come back after seven years to regain her world title, and doing so by breaking Kathy Cook’s British record, which had stood since 1984. She was not quite as taken aback as was Nick Matthew. The 33-year-old Yorkshireman had been delighted just to be invited to our event, and was busily signing copies of his autobiography – the suitably named Sweating Blood – as his name was announced to the audience by SJA vice chair Janine Self as the winner of the Committee Award for winning the squash world title for a third time in four years. Matthew’s recognition – in large part due to the suggestion of SJA member Rod Gilmour – possibly generated more reaction on Twitter than any other, illustrating that while it remains not an Olympic sport, squash still has a massive following. With her training for the day done that morning, Ohuruogu duly thanked her coach of 10 years, Lloyd Cowan, when collecting the Pat Besford Award, though only after having a fit of the giggles when she was forced to do what many in the audience had done, and suffer the agonies of watching the 49.41 seconds of her world championship final which had the closest of finishes. The closest finish among the SJA members’ voting was for the Team of the Year award. Voting had closed before the Ashes cricket Tests had begun, otherwise the margin between the British and Irish Lions rugby squad – who did manage to win a series in Australia – and the England men’s cricket team may have been larger. There could be no more fitting a presenter of that prize than Sir Ian McGeechan, a winner of the Team of the Year award in the past as a player and as a coach in 1974 and 1997 – two of the three previous occasions when the Lions have won our trophy. Warren Gatland’s 2013 Lions were the first for 16 years to win a series. Interviewed by Rosenthal on stage, New Zealander Gatland, who this year also coached Wales to the Six Nations Championship, admitted that, given the opportunity, he might be interested in taking the 2017 Lions to face the All Blacks. See, we’ve barely handed out all our prizes for 2013, and already the allure of future sporting endeavours – with the Commonwealth Games, football World Cup and the Winter Olympics and Paralympics all to come in 2014 – are beginning to beckon. 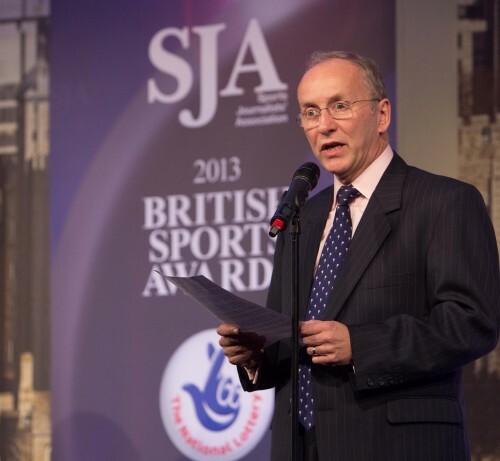 David Walker, the chairman of the Sports Journalists’ Association, used his welcoming remarks at the organisation’s annual British Sports Awards yesterday to pay a special tribute to the SJA President, Sir Michael Parkinson, in his battle with cancer – and to look forward to seeing him at our next major awards event, the British Sports Journalism Awards on March 24. Sir Michael, who has been SJA President since 2004, was diagnosed with prostate cancer in May, and was unable to attend the Sports Awards ceremony at the Tower of London yesterday because he is receiving further treatment before heading to the warmth of Australia for Christmas and the New Year. Walker said, “As chairman of the SJA this moment carries a special poignancy for me. 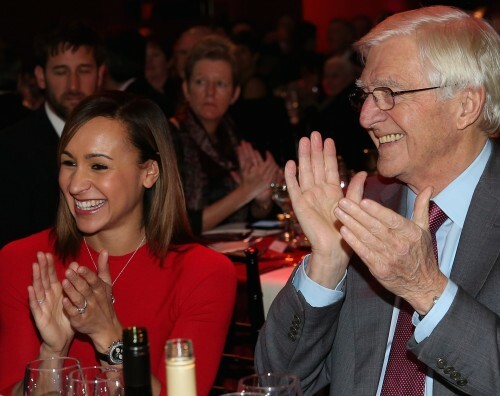 “Traditionally, this welcome is extended by our President, Sir Michael Parkinson. As I’m sure you’re all aware Sir Michael has not been in the best of health recently and sends his apologies for not being here. “Sir Michael is much more than a figurehead of our organisation. We met last week to discuss the planning for today’s event. He was in fine form. And I know he appreciates the support he has received from SJA members and friends as he bravely battles prostate cancer. 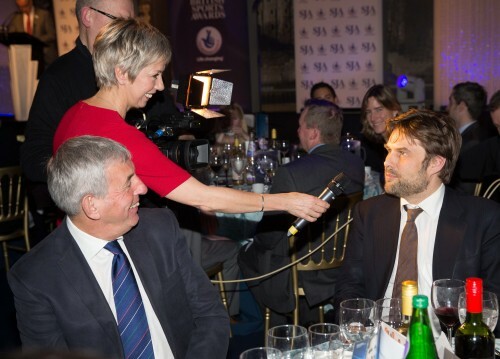 At his first SJA Sports Awards as chairman – he succeeded Barry Newcombe last April – Walker had been able to announce a four-year sponsorship agreement with The National Lottery, joining our existing partners, the Laureus Sport for Good Foundation. “We’re indebted to the continuing support of our sponsors, The National Lottery,” Walker said. 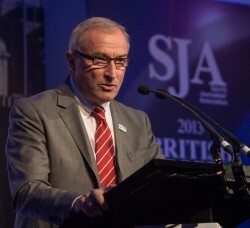 “Managing director Andy Duncan and his team have done much to help the SJA. They’ve done even more to help British sport and our athletes.